In case you missed the meeting on Thursday, here is some important information about the Spring Trip & Mattress Palooza! Each Spring the LHHS Band will travel for a performance. For three years of a student’s four years in high school, the band travels to Corpus Christi for the South Coast Music Festival. Every fourth year, the band travels out of state to perform. Past locations have included Hawaii and Disney World. Be a member of Wind Ensemble, Symphonic Band, Concert Band, or Winterguard. Be an eligible member in good standing for Fall and Spring semesters (meaning: all fall band fees paid in full). Have all trip fees must be paid in full. Send your trip deposit in by Friday, 1/19 with the registration form to the band safe in an envelope marked with your student’s name and Corpus Trip written on the envelope. You can also pay via Charms with a credit card. Be sure to mark in the notes that it is for the Spring Corpus trip. Need lots of chaperones (adults) – consider joining us on a fun trip! 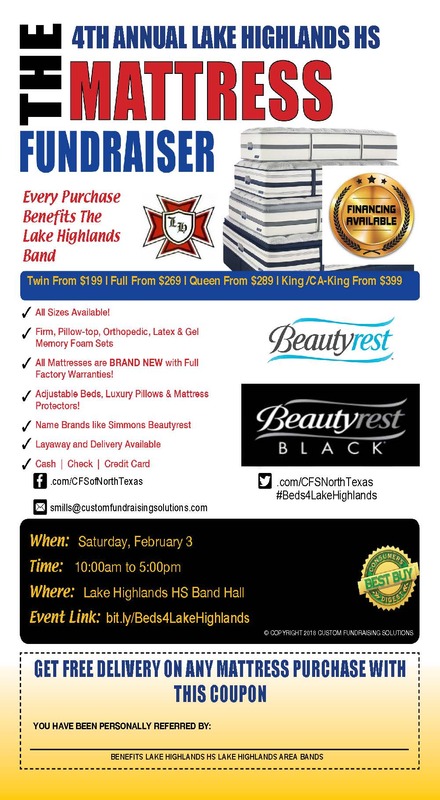 MATTRESS PALOOZA IS ON February 3rd and we need all of you to make it a success! We need everyone to help us promote the event! The success of this relies entirely on us getting the word out about it. In 2017, the event raised $9000 to support the Lake Highlands cluster bands – the highest amount raised by any RISD school.